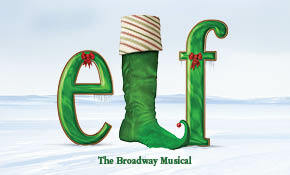 Saturday, November 10, 2018 at 3:00 p.m.
ELF The Musical is the hilarious tale of Buddy, a young orphan child who mistakenly crawls into Santa’s bag of gifts and is transported back to the North Pole. Unaware that he is actually human, Buddy’s enormous size and poor toy-making abilities cause him to face the truth. With Santa’s permission, Buddy embarks on a journey to New York City to find his birth father, discover his true identity and help New York remember the true meaning of Christmas. This modern day Christmas classic is sure to make everyone embrace their inner ELF. Pre-Sale: Tuesday, September 25, 2018 at 10:00 a.m.
On Sale: Friday, September 28, 2018 at 10:00 a.m.
Pre-sale tickets will be available online only at https://bit.ly/2Kz11uq with the pre-sale code. To receive the pre-sale code, please sign up for our free email newsletter at https://bit.ly/2LC76Y2 by Monday, September 24, 2018 at 9:00 p.m. Pre-sale code will be released via email when the pre-sale begins. Tickets on sale to the general public will be available at https://bit.ly/2Kz11uq, Ticketmaster by phone 1-800-745-3000 or in person only at The Dow Event Center Box Office. Subscribe today for the 2018-2019 Broadway in Saginaw series at https://bit.ly/249Fifb or by calling 989-759-1330.